Tua and the Elephant is a beautiful little novel, and it was such a nice change of pace from my read aloud with my son of action and adventure stories that have a lot of noise but very little depth. Which is not to say that action and adventure are not part of this story in which a little girl, Tua, sets out to rescue an elephant, even as she is being chased by two seedy men who have abused the elephant and want it back. Set in Thailand, this small novel gives such a flavor of setting and character, and moves with humor and humanity, making it a perfect read-aloud for home or the classroom. Tua is smart and determined, and her heart is what drives the story forward from the first page to the last. You can’t help but root for Tua and care about the young elephant she is intent on saving. 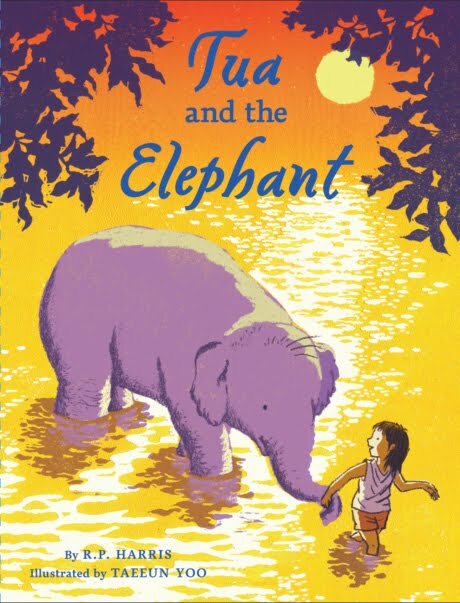 Finding a gem like Tua and the Elephant (I saw it on a table at the book store, and was captivated by the cover, and picked it up) is such a refreshing thing, reminding me of the power of story told with compassion and understanding. Tua lives in our hearts now, too.